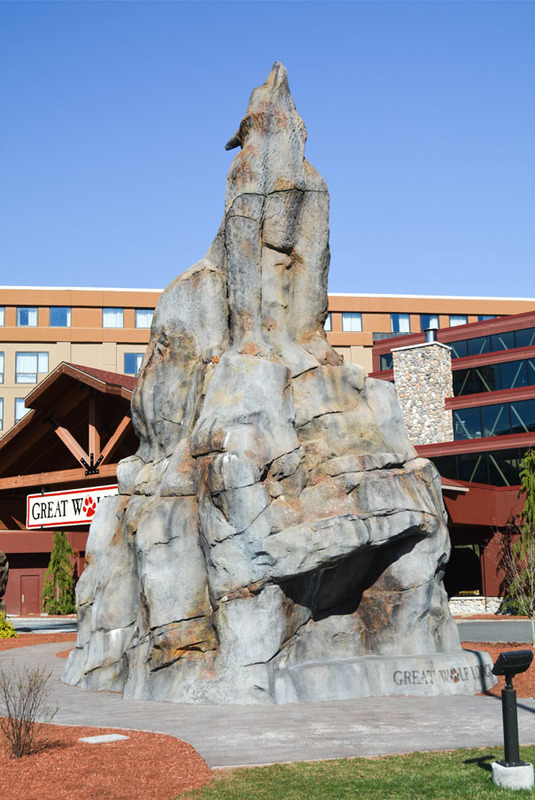 Want to book a trip to Great Wolf? 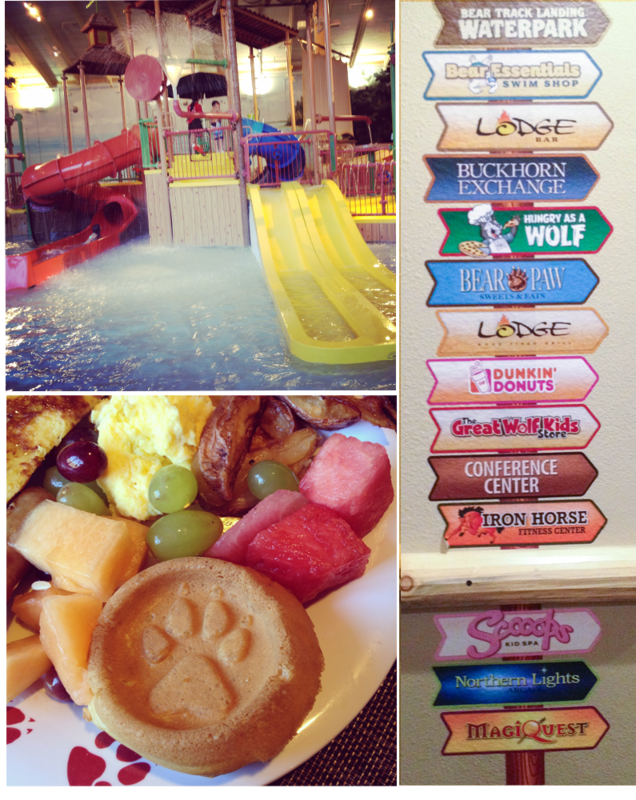 Find everything you need to know about planning an unforgettable trip to Great Wolf Lodge New England. View our tips to find out how to save, what to pack, and plan your day. With the snow finally melted and the school year coming to an end, it’s time to start thinking about summer travel! This past weekend, The Massachusetts Office of Travel & Tourism invited my children and I to experience a few of the most exciting attractions for summer travel in Central Massachusetts with meals, tickets, and accommodations included. Our itinerary was packed full with a visit to Mass Audubon’s Drumlin Farm in Lincoln, The Butterfly Place in Westford, the EcoTarium in Worcester, as well as a night’s stay at the Great Wolf Lodge in Fitchburg MA. By Sunday night the kids and I were exhausted, but we all had an exciting time and are looking forward to spending more time at the attractions this summer. 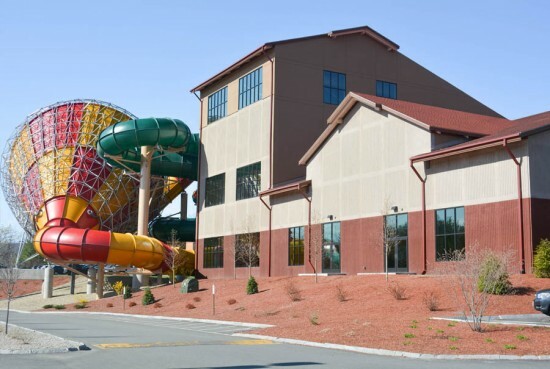 When it came time to head to the hotel, the kids were in for a major surprise at the Great Wolf Lodge New England. They had known that we were staying the night at a hotel, the Great Wolf Lodge, but little did they know that the hotel had an indoor water park, arcades, bowling, and more. 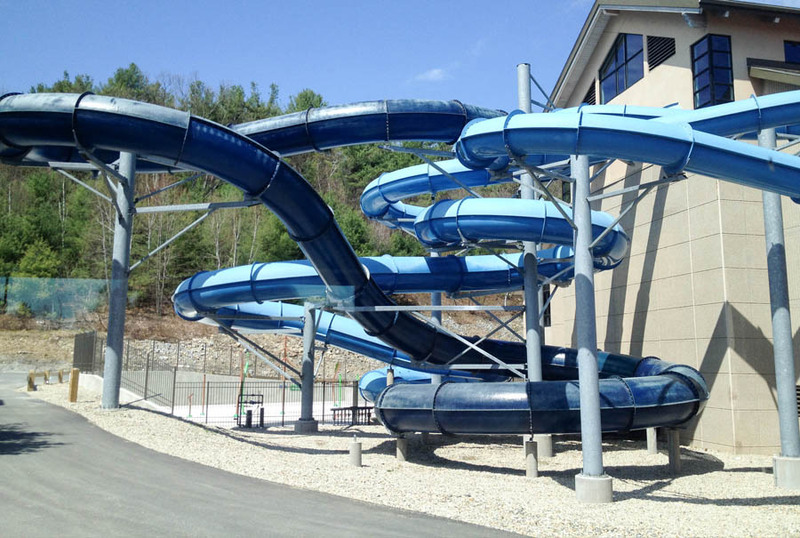 Their shrieks of excitement were priceless as soon as we pulled into the parking lot and they spotted the water slides. Mom, I thought we were going to a hotel? We are, this IS part of the hotel! WOOHOO! You’re the best, MOM! 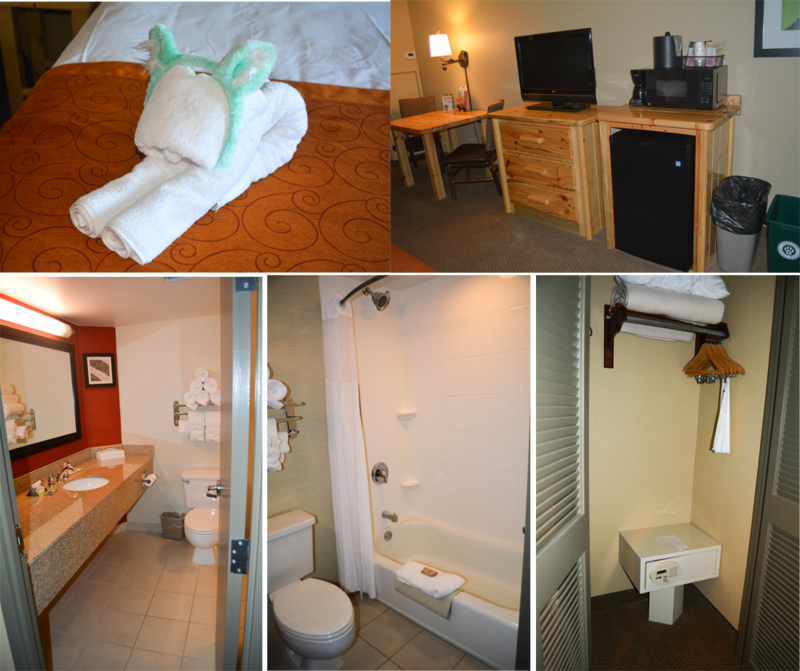 We checked in about 6pm, were given our wristbands & wolf ears, and headed up to our room to drop off our belongings. 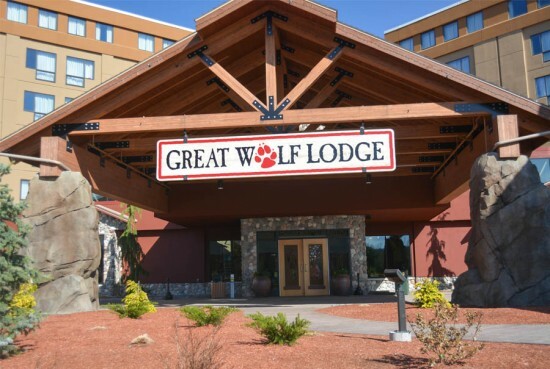 We stayed in the Family Suite during our stay at Great Wolf Lodge New England which features two queen size beds, full size bath, and a living area that includes a twin-size sofa-sleeper and a 32″ TV. Upon arrival into our room, I was happy to see that a coffeemaker, a microwave and a mini-fridge is included in every room, not just the Family Suites. The mini fridge and microwave offer convenience as you are able to bring your own food, or save leftovers and reheat. The fridge was larger than I often see at hotels and is more than big enough to keep drinks and food for a family of four for a few days. Once settled into our room, we decided to take a quick trip to the indoor water park before dinner. There are two different water park sections. The two sections are not joined together but they are just a short walk across the hall from one another. One side is from the previous Coco Key with the lazy river, and on the opposite side is the brand new water park built for the Great Wolf Lodge that has the wave pool. We first started off at Fort Mackenzie, a multi-story treehouse filled with suspension bridges, kiddie slides, swinging cargo nets, kid-activated water effects, as well as a large bucket at the top which spills over once filled. There is no minimum height or age required, and it was perfect for the younger children, like my preschooler. Majority of our water fun, was on the opposite side at the Cub Paw Pool and Whooping Hollow slides. My children would go down the water slides at least a dozen times, head over to the jet-skiis that squirt water, and then head back to the water slides. While they were tall enough for some of the older water slides (they’re 43” and 46” tall) they were completely happy staying in the children’s area, especially once I unpacked their googles. 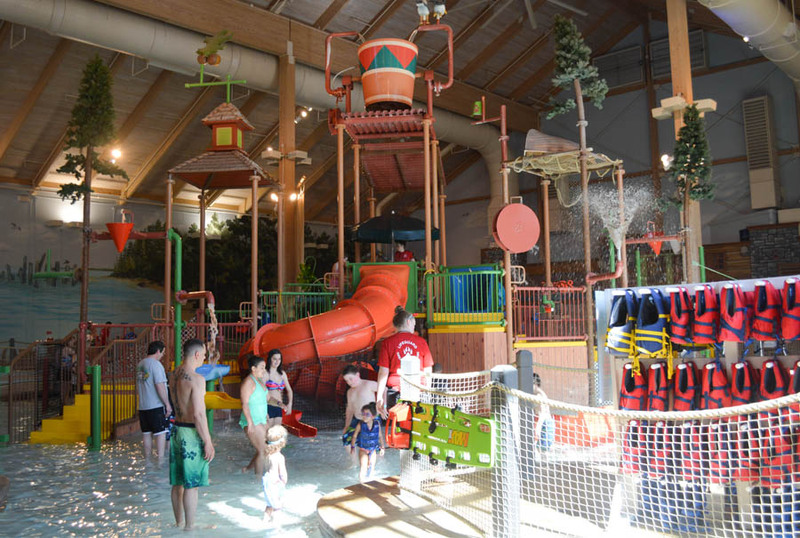 Older children, tweens, and adults will enjoy the thrill of the wave pool, lazy river, Wolf Tail, Howlin’ Tornado, River Canyon Run, Alberta Falls, and Otter Run. We’re hoping to visit again soon to get the full experience at the water park, as my husband was unable to join us, and I wasn’t thinking and didn’t pack my bathing suit. If we were staying longer I would have definitely purchased one from the gift shop and joined in on the fun. 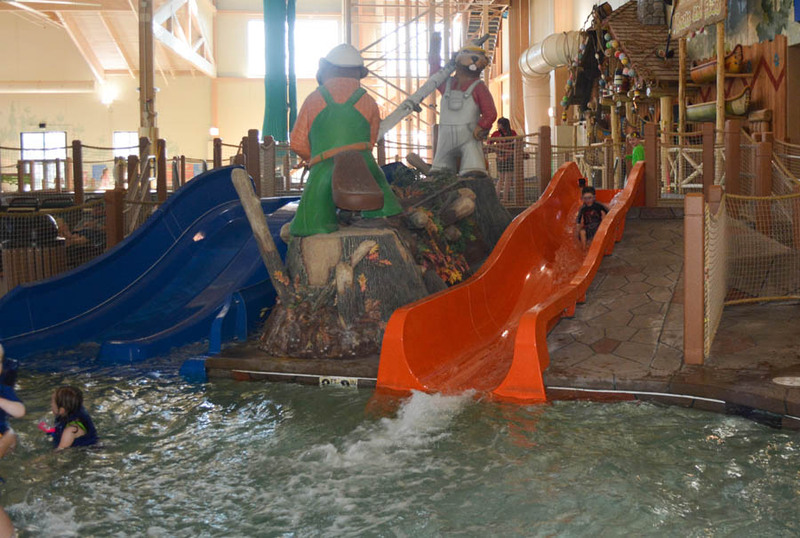 While the main hit at Great Wolf Lodge is the water park, there is still plenty more to do. We spent one night/morning during this trip which was not nearly enough time to do everything. In addition to the large water park area, there are also a number of dry activities offered throughout the day to keep the children entertained from morning till night including dance parties, face painting, and crafts. While we missed The Forest Friends Show, the kids were able to listen to Story Time in their pajamas followed by BINGO at 9:15pm. In the morning we were able to catch part of the Wolf Walk before we headed off to the water park. 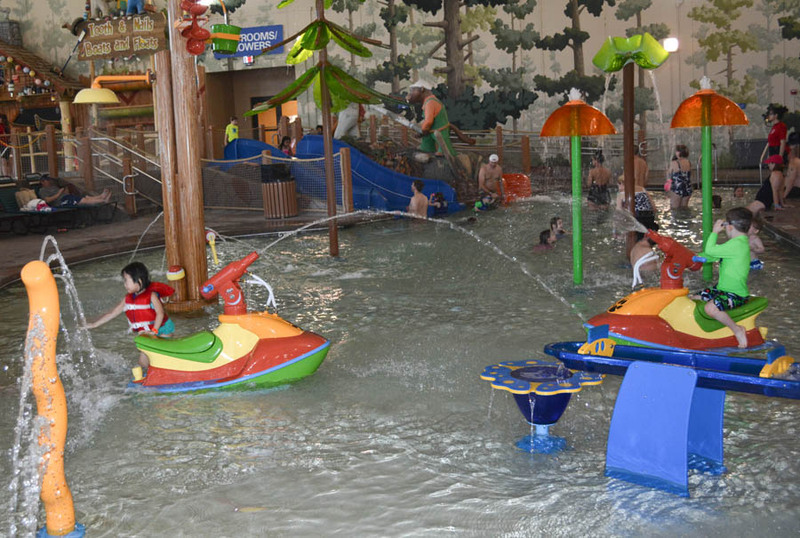 In addition to the water park, which can keep the kids busy for hours on end, there is family friendly indoor play park. 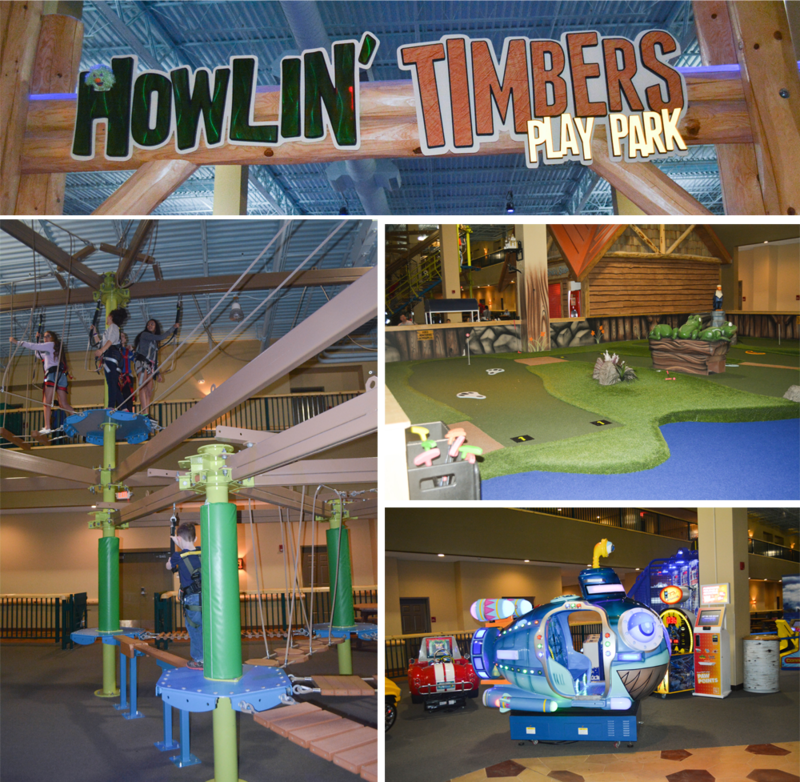 The Howlin’ Timbers Play Park, an indoor play area filled with family activities, is just a short walk away. The Howlin’ Timbers Play Park features mini golf, kiddie amusement rides, and Ten Paw Alley, and the Howlers Peak ropes course. All of these attractions are an additional fee. Guests must be 48” tall to go on the main ropes course that is 30 feet above unless accompanied by a responsible person. For the younger children, there is a smaller ropes course that is just a couple of feet off of the ground. 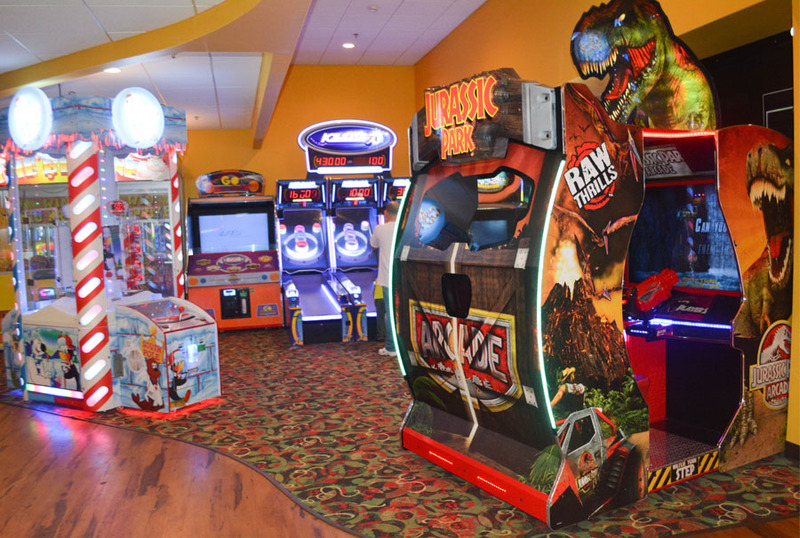 The Northern Lights Arcade is packed full of family-friendly games. There is no coins or tickets to hold on to, everything is stored on your Paw Points card. Once money is loaded onto your Paw Points card, use it to activate each game and reload it with more points for hours of arcade fun. Prize tickets are automatically stored on the card, and can be redeemed at the prize counter. Points do not expire, so if you plan to visit again, just save your card and accumulate your points and tickets. Lodge Wood Fired Grill: Sit down restaurant for breakfast lunch or dinner. Breakfast buffet, wings, burgers and wood-fired specialties. Hungry As A Wolf: Hand-tossed, homemade pizza, savory Italian and meatball parmesan sandwiches, garlic cheese bread and freshly made salads. Call ahead ordering available. Bear Paw Sweets & Eats: Fresh-baked pastries, ice cream, frozen favorites, lodge-made fudge, fresh fruit, specialty coffee drinks. Buckets Incredible Craveables: Located inside the water park. Snacks. Treats. Lunch and Drinks. Sample menu: cheeseburgers, hot dogs, hot pretzels, drinks, ice cream. Dunkin Donuts: Yup, that’s right Dunkin Donuts! For Dunkin’ lovers like me, you’ll definitely enjoy the convenient Dunkin Donuts located in the grand lobby across from the fitness center. Grab your coffee, sandwiches, bagels, classic donuts and Munchkins from morning till night. At check-in, put on your wristband so you will not misplace it. Pack sandals, flip-flops or water shoes for water park area, but make sure to bring closed toe, rubber soled shoes like sneakers for the Howlers Peak ropes course. Water park access is available from 1:00 p.m. on the day of arrival until the water park closes on the day of departure. Checkout is at 11am, so put everything except for water park necessities in your vehicle. 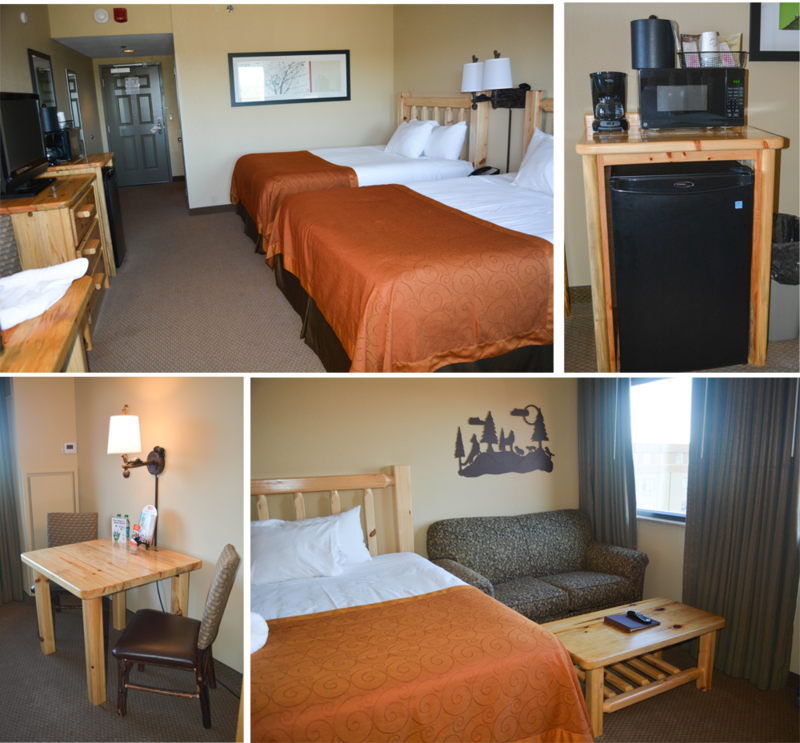 Fridges, microwaves, and coffee pots are available in every room. If you are on a budget, pack food and drinks. Bring an extra wet-bag or plastic bag for wet bathing suits. Life jackets are available – one less thing to pack. Bring your own food: Breakfast buffet and dinner buffet at the Lodge Wood Fired Grill was delicious, but if you’re looking to stretch your budget, pack a cooler and use the fridge and microwave in your room. Purchase deal packages – Expenses can easily add up with all of the attractions and dining options. If you are on a budget I recommend purchasing a package or play passes such as the Paw Pass or Wolf Pass as they can offer some great savings. It may seem like more money, but once you start adding on activities you will end up saving in the long run. 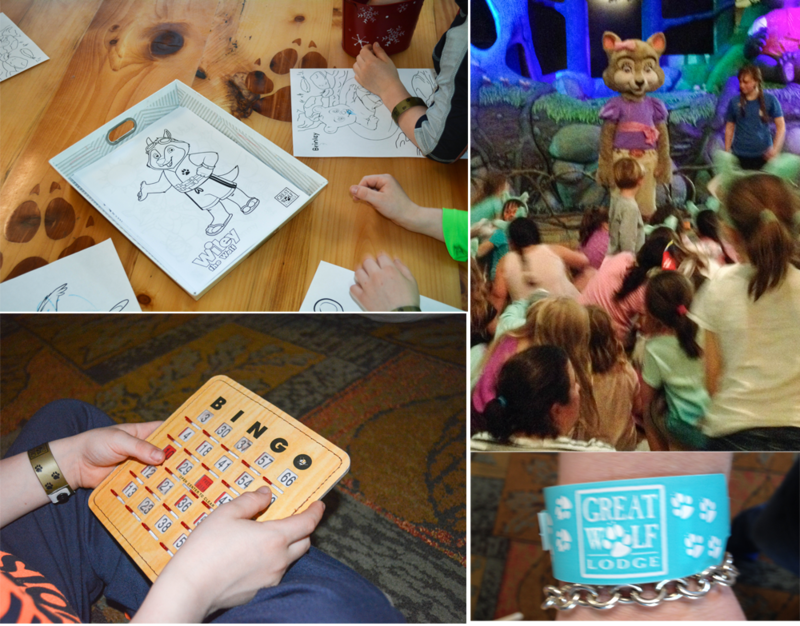 Sign up for a Great Wolf Resort emails and Groupon for promotions, news and updates. Looks like a really fun place to stay for a family get away. The rooms are nice and its great they have a kitchen. Wow this place looks amazing with so much to do! My grandsons would love it! This looks like a really great place to take the whole family!